The beautiful Spanish island of La Gomera has been the chosen point of departure for Atlantic crossings for decades, so it’s not surprising that the annual influx of the extraordinary clique of past, present and future rowers, has left an indelible mark on the tiny port of San Sebastián. As a 2017 and 2018 race observer, I am familiar with the incredible emotional response these exceptional human beings evoke. Watching the tiny boats making their way slowly across the vast expanse of sea, imagining the highs and lows they are facing, feeling the upwelling of gratitude when they arrive safe, but changed forever, on the other side, is a rollercoaster for the watching world. The Talisker Whisky Atlantic Challenge inspires imagination and creativity. In 2016, a group of local artists in La Gomera began hosting an annual exhibition and we were touched to be invited to attend this event showcasing an array of genres reflecting the emotion of the race depicted in sculpture, photography, literature, music, journalism, painting, drawings, cross-stitch and poetry. Each of the rowers was given a small wooden carving, a talisman to remind them that they “never row alone”. The gorgeous Grandads of the Atlantic receiving their talisman and good wishes for the row from the artist community in La Gomera. The artwork is magical and shows the local talent’s deep understanding of the journey the rowers face. Artist Eduardo J. Castro creates a notebook each year, and collaborates with Alfonso Andériz for the illustrations of the teams and their boats, while Juanma invites all the rowers to record their personal motivation for their journeys. It is a beautiful record of a special time, and they’ve done one each year for the teams. Two pages are allocated to each team and the boat illustrated. 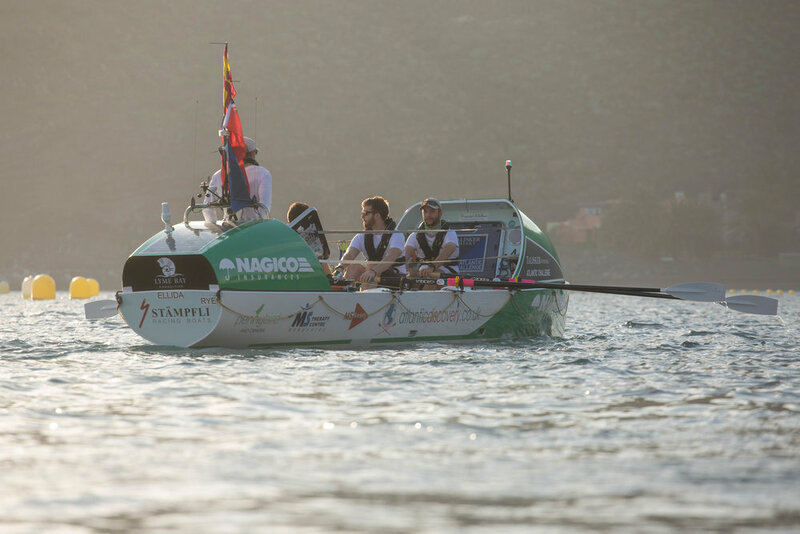 Each team member is then invited to record their personal motivation to row the Atlantic. I have the greatest respect for the two main race photographers Ben Duffy and Ted Martin who are part of the fabric of this event, and who capture the heart and greatness of the rowers in the moments they are at one with the elements. They have both produced iconic photographs over the years which epitomise the magnitude of the participant’s achievements. Ben Duffy does the official pre-race photograph for Atlantic Discovery. Almost a rite of passage, rowers scribe their names on the wall in the Blue Marlin Taberna - a local bar and eatery on the edge of the main plaza in San Sebastián. Studying the artwork gives one a sense of the history of these explorers and adventurers. Look out for Atlantic Discovery on the right hand top corner of the taberna as you enter the door. Atlantic Discovery enjoying one of their final cold beers before the start of their row in the shade outside the Blue Marlin Taberna. Bruce Parker sent in this poem from South Africa. He penned it during Atlantic Discovery’s crossing. And a stroke meant we were not there anymore! Our supreme effort gone in a vanishing swirl? It didn’t that we could see. And run by the ocean? Wasn’t this our show, ours to own? Hidden now by distance and an endless skin of blue. And we were headed there. No matter how sticky the ocean! And grin in the burning flares of victory. For she was as much us as we. All done and dusted and now to pack? As real as the oar grip our souls would always know. Reached for the imaginings of those who could never follow. Follow Atlantic Discovery’s journey along the green line. Be part of our story by donating here.